Spiritual but not religious – Good or bad? The word spiritual is something to do with individual issues of human identity and personal development: hence seeking the sacred and the mystery of life beyond ones sense of selfhood. Being religious seems to be having a sense of identity with and commitment to a community of fellow believers and an acceptance of the external authority of religious teachings. Beliefs tend to be couched in terms of theology, mythology and metaphysics. Are some people spiritual but not religious? One definition is the attitude that physical well-being and worldly possessions constitute the greatest good and highest value in life. Such a person is less likely to pray or meditate. Research has found that people are religious in different ways. A so-called ‘extrinsic’ orientation is said to be characteristic of those who are disposed to use religion for their own ends. Some people regard religion as useful because it can provide security and solace, sociability and distraction, status and self-justification. Such a person can be said to turn to God without turning away from self. Prayer is likely to be restricted to participation in public prayer. Commentators refer to a range of ‘pick & mix’ beliefs and loosely defined framework of implicit world views about life. Such individuals tend to meditate rather than pray. The psychologist Gordon Allport said that what he terms an ‘intrinsic’ orientation is finding one’s master motives for life in religion. Other needs, strong as they may be, are regarded as of less ultimate significance, and they are, so far as possible, brought into harmony with religious beliefs. Such a person lives his or her religion. I would suggest that here there is an attempt to relate in prayer one-to-one with an image of a personal yet transcendent God. Being religious means accepting the value of knowing about divinely revealed ideas in religious culture and also being spiritual means finding the divine spirit within inner experience. From the perspective of the spiritual philosophy of Emanuel Swedenborg, we should see the doctrines learned from one’s religious tradition only as a stepping stone towards inner enlightenment. Why do many people reject religion? A punitive image of deity, and they see as other superstitious supernatural beliefs, turn many off religion. They dislike the hierarchy of organized religion in so far as ordained clerics authoritatively tell them what to believe. Better when those in a position to do so offer to share their insights. The religious doctrine held by some Christians is that what one believes is what really matters for salvation, rather than having a charitable heart. Other church-goers have an excessive concern with buildings, and money to support the external side of religious ritual and ceremony. Non-Christians probably see both types of religious people as hypocritical. Surely living as well as believing one’s faith is necessary for spiritual experience? Different faith traditions teach different things. I can’t help but conclude that each religious tradition has a different mix of what appears to be true and mistaken ideas. I like Hinduism’s idea of the moral intent and actions of an individual affecting their future inner well-being: I like Buddhism’s idea about craving and attachment as the origin of suffering: I like Islam’s emphasis on the oneness of God: and I like Christianity’s view of Christ as the human face of God. But there are also ideas that we find in some strands of all these faiths, too numerable to list here. These I dislike and do not find credible. Can we hope in a new spiritual era of civilisation? I would like to think that more coherent ideas about personal life are now possible. These may be due to a growing inner freedom from dogma and authoritarianism of all kinds. According to Swedenborg, those outside of the old established religions will more easily form an enlightened civilised way of living. The reason he suggests is such people don’t identify with mistaken doctrines. He says such domas distort the truth about what is spiritual. At the same time I feel there is a danger of throwing the baby out with the bathwater. This would come from entirely rejecting ideas from religion. You might discard religion’s moral rules of conduct because you see them as moralistic. Generalising and labelling people as bad. In so doing I would suggest you may not have noticed the spiritual principles underlying notions of right and wrong. Such deeper ideas give guidance about an angelic way of heavenly life. Private practices aimed at self-enhancement and fulfillment attract those who are spiritual but not religious. They run the risk of being self-regarding. This means missing the chance to belong to a community of shared belief. A belief where social commitment to the spiritual welfare of others is an important focus. Religion offers us the chance to find trust in a forgiving compassionate personal God. I think I can recognise some other remaining pure elements from the world’s faith traditions. The world’s next spiritual era can perhaps develop from these. 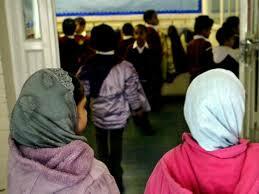 My gut feeling is we need to ensure faith schools develop tolerant attitudes towards other faiths. We should prevent them taking their religious cultural focus too far. Truth – Only private & subjective? Religion – Does it have anything to offer? Next Next post: How to be more spiritual?